To help with this, we have developed a social media toolkit that provides you with guidance and ready-made posts to ensure the campaign and its core messages are amplified across the online global cancer community. 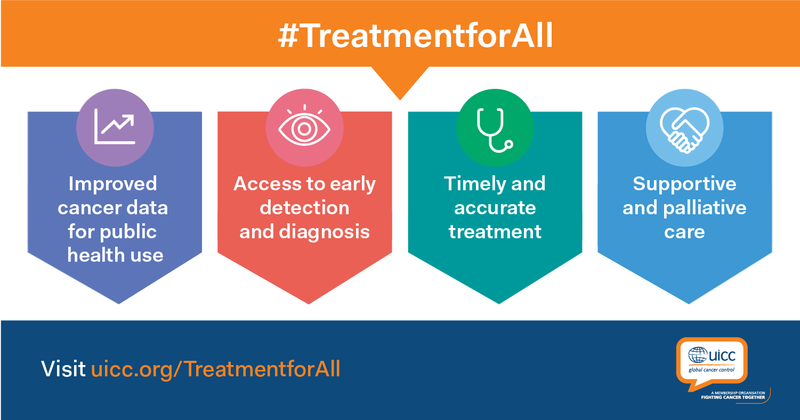 We encourage UICC members and partners, members of the wider non-communicable disease (NCD), global health, and development communities to join the online conversation to elevate the campaign with the hashtag #TreatmentforAll. We have created a series of social media cards that you can use to make your publications more visual and likely to be shared. You will find a series of ready-made messages in the toolkit to spread on your social channels and alert decision makers in your country or region about the urgency of action required to meet the commitments they have made to deliver a 25% reduction in premature deaths through cancer and other NCDs by 2025. Timely customised messages aligned with each important date on the health and development agenda will be available on the Social Media Hub to leverage key opportunities to amplify the campaign messages. To support your messages, UICC has developed a series of social media cards with key messages from the cancer resolution. Tweet these out using with the hashtag #TreatmentforAll and #CancerResolution.